There was an abundance of quality to go with the quantity when the Peterborough Police Amateur Boxing Club staged an action-packed show in the city on Saturday. A bumper crowd at the Queen Katharine Academy at Walton witnessed 14 contests - two skills bouts and a dozen fiercely-contested scraps - and there was plenty of local success to savour. Jaansher Raja (16) set the ball rolling for the host club when he picked up an impressive points win against Thomas Petchall from the Albion Boxing Academy in a 59kg match. Raja found his range early doors with straight powerful punches and went on to win every round. The next Peterborough Police win came from Emily Anderson (13) from Hampton. She really excelled in her first competitive 40kg bout against Kiera Pearson from Leicester Railwayman’s ABC. She was well on top throughout and twice forced her opponent to take a standing eight count on the way to a unanimous points victory. Peterborough Police win number three came from Ali Raja (14). He used his height and reach advantage to great effect in a 56kg junior match to beat Hamza Haidari from Bulmershe ABC comfortably on points. Next came the host club’s performance of the night as Imran Aref (19) outclassed Raja Khan from Strike 06 ABC with a dazzling display of accurate long shots and stunning combination punching on the inside. He won by a distance on points. And another cracker was to quickly follow as Domenico Ciani (16) chalked up a fifth win for the home corner by outpointing Jay Snow from the Queensberry Police ABC in a 69kg match-up. Snow was a two-time East Midlands ABA champion but it was Ciani who looked more like the champion in this crowd-pleaser. He took every round with his crisp long shots and smart combination work on the inside. The show finished with two more home points wins. First Daniel Meins (32) from Dogsthorpe outfought Hareem Ali from Boston ABC in a toe-to-toe 69kg battle and then in the top-of-the-bill bout Brian Lawless (20) from Dogsthorpe used his quality boxing skills and superior power to beat Carl Jupp from Skegness ABC. That made it seven Peterborough Police wins but they could quite easily have had three more winners. Rushaan Raja (11) and Aamir Shirazi (11) were both pipped on points - by Hi Tech Boxing Club pair Mustapha Mbye and Muhammed Ali Harbi respectively - in close contests that could have gone either way. Emily Anderson was a winner for Peterborough Police ABC. Shirazi won the best runner-up award chosen by the Police Crime Commissioner Jason Ablewhite. And unlucky loser number three was Ryan Davies (19) from Yaxley, who was stopped because of a cut eye sustained in a clash of heads with Alex Lindsay from Norwich Broadside Warriors BC. There was just 17 seconds left and Davies was well ahead on points. Peterborough’s Top Yard School of Boxing had two fighters in action and both were pipped on points in all-action three-rounders. They were Hasnain Hussain (16) against Spencer Binks from Bennys ABC and Mustafa Rafiq (17) against Reece Leggett from Norwich Lads ABC. The show kicked off with a couple of tasty skills bouts. 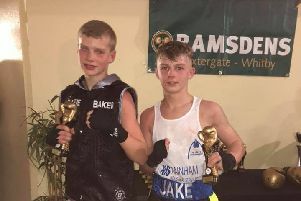 In the first, 10 year-old Reggie Baker from Stanground oozed confidence and quality for three rounds against Ethan Bird from Northampton ABC, and then Patrick Connors (10) from Paston caught the eye with his counter-punching against Harrison Murphy from Thetford Town BC. Chris Baker, head coach at Peterborough Police ABC, said: “It was another fantastic show from the team at Peterborough Police Boxing Club and a massive thanks has to go to our awesome team of volunteers and coaches who all put in a quality shift to make it such a successful show.